I blame Moleskines. I had never even though about notepad brands until I picked up one of those expensive little tarts in a store. Then I saw the little sticker they all have that boasts about how they were once the workbook of choice for Hemingway, Picasso, Jesus, or whoever. I wasn't immune to the romance of the idea. In that moment I suddenly had a vision of a bookshelf loaded with pleasingly battered-but-matching notebooks, each filled to bursting with my scribblings. What could be better? Well, them not being Moleskines for a start. Regardless of their rather ridiculously high price, I discovered that I don't much care for them. The paper is too shiny and doesn't seem to absorb ink very well (an important factor when you're trying to write in a smudge-prone hurry). Plus, they make you look, well, a bit pretentious. 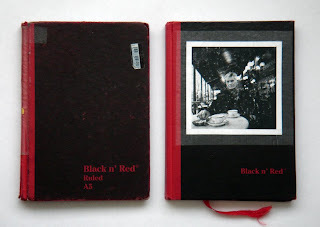 So now I'm going steady with the Black n' Red notepads pictured above instead: hardback, casebound, A5, ruled. As well as being pleasingly European, the A5 size (148 x 210mm, or slightly wider than a sheet of letter paper folded in half) is just right for my needs. The books are small enough to be portable, but big enough to make writing on my lap reasonably easy. I'd already discovered that smaller pocket-sized pads are hard to write in when you don't have a desk handy as they offer no wrist support, which is the same reason a hard cover is also essential. 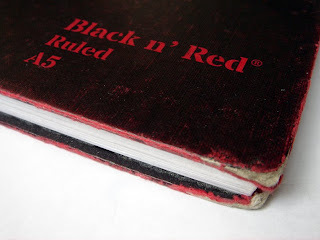 Black n' Red offers similar books with a spiral wire binding, but I've never really cared for these: the pages can be ripped out too easily (often by accident) and the looser binding makes the whole thing feel flimsy and cheap. In contrast, these casebound pads have proper sewn-in pages, as well as a handy marker ribbon to make up for the lack of a place to store your pen. But the thing I really love about these notebooks is the way that, as they wear and get scuffed around, the black around the edges rubs off to reveal red colouring underneath; sometimes it's the little things in life that are the most pleasing. 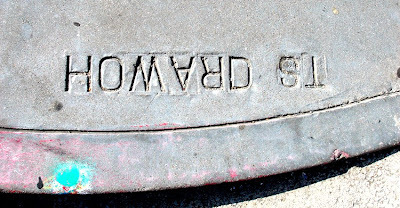 One of San Francisco's many little quirks is the way that its street names are written on the sidewalks – either embossed or inlaid into the concrete – on each and every street corner. Unfortunately, the concrete guy seems to have had a little trouble at the meeting of Howard and 2nd streets, a discovery which led me to discover a whole Flickr collection of misspelled or mutilated street names from around the city. But, while lots of people gleefully post pictures of similar mistakes, I can't seem to confirm the story I've heard about why the names are there in the first place. Supposedly, the practice began after the 1906 earthquake and fire, when parts of the city were devastated to such an extent that the emergency services had trouble finding their way around – with large areas razed to the ground, all the normal buildings and landmarks they would have used to navigate by had disappeared. But, while walls may still collapse and street signs fall in a future quake, these sidewalk signs should remain. Indeed, they already help people to find their way around; as this Flickr user says, "It's hard to get lost in San Francisco." But what I like most about them is that they reinforce a powerful sense of place for those of us lucky enough to live here.